A colorful trophy animal caught my eye via an Etsy email... one click over to Paperwolf and I knew I had to share the fab sculptures of Wolfram Kampffmeyer in Stuttgart, Germany. A special aspect of these animals is that DIY-ers can enjoy constructing their own. 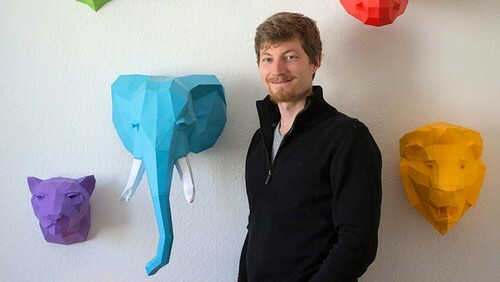 Wolfram studied computer animation at Filmakademie Baden-Wuerttemberg in Ludwigsburg, Germany where he came across a program that aided the transfer of virtual 3D models into papercraft templates... and thus LittleBigPiggy, the first member of the Paperwolf zoo was born. It is, as he says, "easy to handle, house-trained and always in a good mood." Looks like it to me! It wasn't until the development of The Big Five however, did the Paperwolf animals truly catch on. The clever figures are most disarming, plus there's the attraction of naysaying big game hunting. I can picture one as eye-catching decor in a child's bedroom or playroom. While little boys may go for a lion, elephant, or rhino, I have a feeling many young girls would like a pastel unicorn to grace their walls. In fact, the unicorn is the best seller. The high quality card stock animal in your choice of color is shipped pre-cut with perforated folding lines, along with the all-important construction manual. Wolfram advises that a glue stick, time, patience, and some spatial sense are necessary for successful construction. Stuck? Not to worry... he is only an email away; this is backed up by positive customer reviews. Wolfram has extended an offer to All Things Paper readers... the first ten customers to place an order for a trophy animal will each receive two Paperwolf template postcards of choice with their order. Be sure to include a message to seller stating that you have come from this site. Wolfram's favorite animal at the moment is also his most recent creation - the impressive fox at the top of the page. All that the paper menagerie needs now is a wolf! Paperwolf is on Etsy and Facebook. This is not a sponsored post - I just happen to admire Paperwolf's animals. These are simply incredible! I would love one of these on my wall! Oh my gosh! I LOVE THESE SO MUCH! I'd absolutely choose an elephant, but the penguins are hilarious. And I shared this page with a friend who loves foxes. Just incredible! just brilliant! !how wonderful an idea! !i can't decide which is my fav...but the unicorn and the elephant and the deer do tickle my fancy!! I like the fox best !! it must have taken a genius to think of this great idea. So interesting and life-like!!!! TFS Ann! All of them were nice..